We’re closing on our new house in less than two weeks which means I should be packing up boxes, going through miscellaneous items, and all of the other boring moving stuff. But I’m not. I’m scouring the Internet for new furniture for our new digs and I don’t even feel bad about it. I like to think of it as “prepping” for new space. And the past few days I’ve been spending my “prep time” looking at gorgeous entries. Ours will be small but it doesn’t mean it can’t be interesting. Don’t you love how it defines the space without breaking it up all at the same time? Lucite is pretty much magic. Beautiful, beautiful magic. So in order to “prep” a little more (it’s always good to be prepared, right? ), I thought that I’d make a mood board for how I see it styled in our new house. I’m planning on painting the walls a soft bluish gray which I think will look gorgeous with the rug and art and help tie everything together since we’re pairing modern and traditional pieces. So tell me, are you a fan of the lucite table or is it too modern for your taste? Would you pair with only modern touches for a cohesive look or try to balance it with more traditional pieces? What a gorgeous table and it looks perfect there! I love that table! I think an entry table because it gives a homey feel to an entrance and allows you to display items that mean a lot to you to guests. 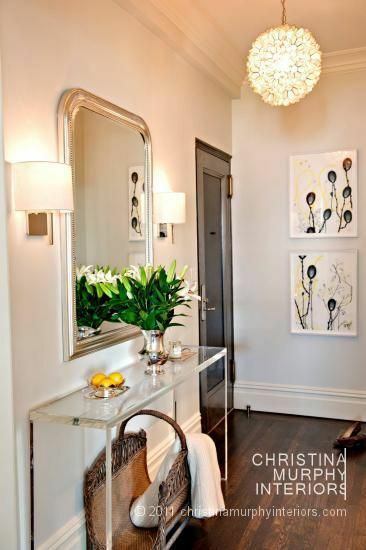 Your lucite choice allows the option of an entry table without breaking apart the space with a wooden table. Great post! I love lucite! I saw a table similar to that at Home Good recently. I agree they really help keep things very visually clear. 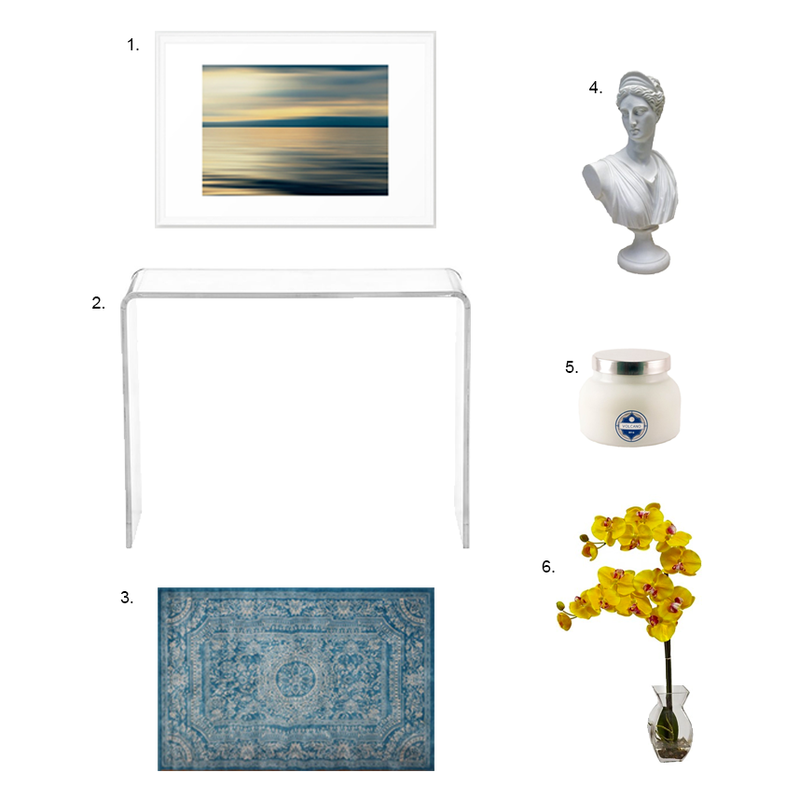 I love your mood board, it’s a great start and the idea for an acrylic entry table is spot on. (I just wrote a post about my little bust – that’s on my desk). Don’t know what state you live in, but here in Chicagoland area, the estate sales are always full of Lucite items dirt cheap. I loved your post on busts! I commented on your post that I have 2 but I realized that I have a horse head as well so I’ve actually got 3! Great table…it’s so unique! I think it’s great to combine modern and traditional, along with anything else you love! I try to focus on buying things I love without worrying too much about having a certain “look” in my home, and it always seems to come together. Thanks- It’s something I’m having to learn since I pretty much only bought more traditional pieces prior to marrying my modern-loving husband. I;m moving into a new apartment within the next couple of weeks and am totally horrible at interior decorating. I love your style…Thanks for the inspiration!! I love lucite. I think it looks beautiful in that picture! I plan on getting some lucite chairs once my home is built. I definitely like a balance of modern mixed with some vintage pieces. Sounds like your home will be beautiful! When is your house done? How exciting! !